It’s the modern-day return of rails on Atlanta’s streets. A festive spirit welcomed the launch of the new Atlanta Streetcar on Wednesday as hundreds of people gathered in downtown at the historic intersection of Peachtree and Sweet Auburn. They came to witness a ceremonial ribbon-cutting ceremony; hear a brass band followed by short speeches by Mayor Kasim Reed and others; pray with the clergy from churches along the Auburn Avenue corridor; and be among the first to ride the first streetcar to roll along Atlanta’s streets in more than 50 years. What’s old is new. What’s new is old. The city of today is meeting the city of yesteryear – before the automobile paved over a street-life that catered to people and sidewalks. We still have a long way to go before we are able to replicate Atlanta’s streetcar network that existed in the 1940s. The sleek look of Atlanta’s new streetcar is a departure from the streetcars of the past – giving that 21st Century flavor rather than a mid-20th Century feel. “I want the new Atlanta streetcar in the new James Bond movie,” said Mayor Reed, hoping to tie the streetcar to the city’s favorite new industry – the movie business. Already the leaders behind the Atlanta Streetcar were contemplating how to expand the system beyond the current 2.7 mile east-west loop that connects Centennial Olympic Park with Ebenezer Baptist Church. The mayor said he’s so happy to get started, and he is looking forward to extending the streetcar less than a half mile to the east so that it connects to the Eastside Trail of the Atlanta BeltLine. Keith Parker, MARTA’s general manager and CEO, showed up on crutches to the event – almost a metaphor of the toll it takes to build rail in this day and age. The past. A.J. Robinson, president of Central Atlanta Progress, said it took the focused attention of two administrations – former Atlanta Mayor Shirley Franklin and Mayor Reed – to bring the streetcar to fruition. It also took an investment of nearly $98 million, with $47 million comring from the federal government, to build this first leg of the streetcar. The investment also included the maintenance facility – built under the Downtown Connector – which can serve more rail cars for an expanded system. The future. As with any transit project, the more lines one develops, the more valuable and accessible it becomes. When Atlanta stopped expanding its MARTA rail lines, it quit providing comprehensive transportation alternatives to its metro residents. If Atlanta stops expanding its streetcar network, it will not fulfill its mission as being a true transportation alternative for people who live, work and play in the city. The more transit options we have, the more opportunities we will have to create an urban area that is not dependent on the automobile. Investing in transit also means investing in the operations and not just construction. Keep fares low. Make the service as frequent as possible. Then transit will become a real option for everyone. So the new Atlanta Streetcar heralded a new beginning for our city – one where we should boldly venture to the next places that will be best served by streetcars. Where Atlanta’s streetcars should travel in the future should be a community-wide decision based on solid facts and data with an understanding of the development, ridership and revenue-generating opportunities of each route. 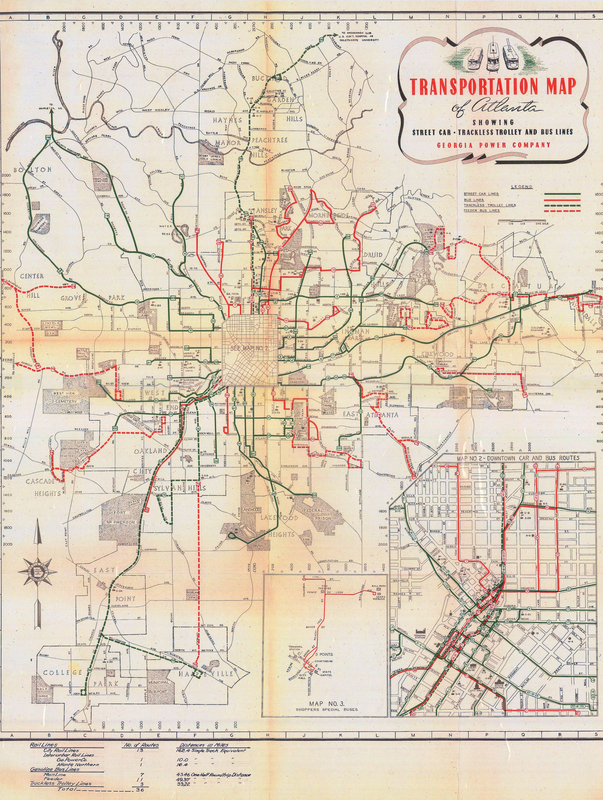 If we look back to the past – to the 1940s, we can see how extensive a streetcar system Atlanta used to have – a system that we stupidly let disappear. Now we are going back to the future, or going forward to the past – with a great new feeling of optimism that our city is restoring its heart and soul. As they would say in New Orleans: Let the good times roll. In Atlanta, we now can say with similar enthusiasm: Let our streetcars roll. A family affair – Mayor Kasim Reed gets parenting help from his brother, Tracy, who seems thrilled to hold his niece – Maria Kristan Reed. A.J. Robinson in background. I couldn’t agree more. The City of Atlanta cannot complete a project on budget and on time. The latest acknowledged Streetcar cost is at least 41.5% over budget and the project was completed at least 18 months late. All of the extra costs will be paid by the City of Atlanta taxpayers. The same service could be delivered by two dedicated MARTA buses at much lower cost. Buy three buses for $700,000 each – that’s $2.1 million capital cost versus $98 million for the Streetcar. Operating two buses for 118 hours/week costs about $1.5 million per year. Ignoring inflation, the cost to buy and operate buses for 20 years would be $32million, or about 1/3 of what was spent just to build the Streetcar.